NEW YORK—John McAfee, who created the world’s first antivirus computer program, VirusScan, in 1987, and became a news sensation in 2012 when he was on the run from the law in Belize, gives a sobering view of how we are allowing technology to slowly erode our privacy, and with it, our basic freedoms. When you go to the grocery store and meet a new clerk, do you tell that clerk all the details of what you did the night before? asks McAfee. What about your bank problems? The mortgage on your house? When you leave the store, maybe you bump into an acquaintance, and with this person, you make small talk about how their family is doing. But you don’t divulge to this person the level of information you would to a close friend, he points out. “We have a social structure and order and process for such interactions, and they involve very limited choices,” McAfee said. Privacy is complex. It’s not as simple as ‘I’ve got nothing to hide therefore, I’ve got nothing to fear.’ If everyone knew everything about everyone else, there would be riots in the streets. 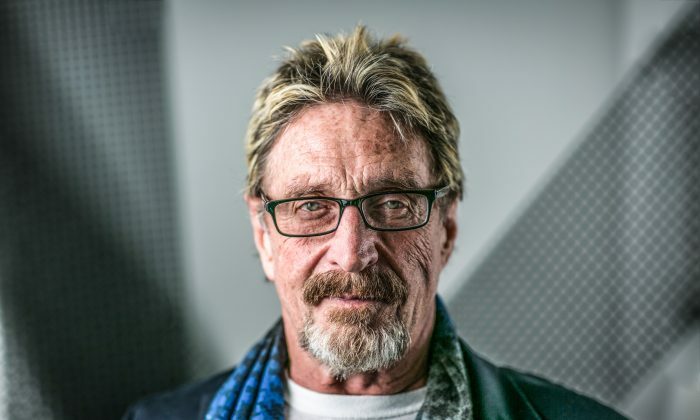 McAfee views privacy as “the glue that holds our society together.” There’s the understanding that if we all divulged every detail about ourselves—our deeds both good and bad, all of our political views, all of our thoughts and opinions—it wouldn’t be our similarities that stick out anymore, but rather our differences. The human race tends to be as judgmental as it is loving, he said. If people knew the misdeeds, betrayals, and bad thoughts of everyone around them, it could lead to riots in the street. “It is the negative qualities that require privacy in order to have a smoothly functioning society,” McAfee said. As people divulge their deeper ideas, people with different views are often left feeling offended. The divulging of information, in this case, is leading to calls for the online censorship of rival viewpoints and information. Twitter’s recent purge of alt-right political commentators could be seen as a worrying precursor. The idea of a single authority having control over information, the ability to discredit ideas and opinions, and the ability to censor at will, brings prospects that McAfee believes we as a society should find deeply concerning. We’re already seeing this, as major technology hubs like Facebook and Google become both the storehouses of our personal information and the choke points of information we are able to receive. “Google has prohibited power, has unconscionable power,” he said. “It will be,” he said, “the dictator of information. “What I choose for you to believe, understand, know, or to fight for is the ultimate power. In the endless barrage of information, the challenge becomes knowing what is fact and what is fiction. Any information filtered by that person, he said, is going to be colored by their own prejudices and judgments, no matter how kind the person may be. People also underestimate the significance of the data they generate, said McAfee. Beyond the bits and bytes stored on smartphones, people leave a wealth of information behind with every website they visit and every purchase they make. Everything from Facebook comments to phone calls leaves data to be harvested. “It’s every interaction of your life in the electronic world,” McAfee said. He believes the rapid erosion of privacy, and the corporate collection of our personal data, is threatening society in a fundamental way. “I see this headed in a direction that will cause a major collapse of the social order,” he said. Our personal data is being traded, used, and monitored. Businesses like Google are using it to serve us advertisements. Companies are using it to understand our behaviors and personal interests. Governments are using it to watch for threats, or to prosecute us if we step out of line. What I said 10 years ago is happening. What I said last year, it’s happening. But it doesn’t make me less of a lunatic. McAfee noted that most great military leaders were great because they could predict the actions of their enemies. Now we are divulging data that can be used against us, in just the same way, right down to our most basic activities, interests, opinions, and beliefs. “The goal of every dictator has not been absolute power,” he said, “It has been absolute knowledge of the populous, because a dictator who knows everything about you—where you are, who you’re with, what you’re saying—that man will never be unseated. This has been the search of all dictatorships since Adolf Hitler. As we enter a new the world of big data and the loss of privacy, there exists a power of dictatorship unprecedented in human history, an ability for a government to know the intricate details of its citizens, and shape their reality according to its machinations. “This is that combination of what the dictator knows about the individual, and what the dictator allows the individual to know about his or her reality,” he said.